As the title says, this post is all about the comedies. Longevity: ★★★★★ – Because they’re still airing. The show has rebooted itself more times than tech support. Longevity: ★★★★★ – Ten seasons and a movie? Longevity: ★★★★★ – Final season. Not as “fresh” as it once was. Longevity: ★★★★★ – Still plenty of stories to tell. The question is how long you have. Adult animation + good writing = high bar. Longevity: ★★★★★ – Bring the meta. Cool show, but not as cool of an acceptance rate. Longevity: ★★★★★ – Another comedy airing its last episodes. The precinct that was promised. Longevity: ★★★★★ – Saved by the bell. Longevity: ★★★★★ – How many more stories can you cook up? Longest-running live-action sitcom in American TV history. Longevity: ★★★★★ – I mean damn. Longevity: ★★★★★ – …however we’re now entering an era of shows with longer breaks between seasons. Plus, still widely accepted. Longevity: ★★★★★ – Delayed final season until 2020, so you’ve got another year or two. Longevity: ★★★★★ – Kind of still on the air? But then again, what is the air. More integrity than the real world equivalent. Longevity: ★★★★★ – A few episodes remain for a final presidential term. No comment needed for a now-iconic series. Longevity: ★★★★★ – Another show with large gaps between years, allowing a more evergreen spec approach. Big entry for Barry, which wasn’t even on the board last year and is already in its second season. Longevity: ★★★★★ – Will last as long as Bill Hader wants it to. Strong showing from a series considered a Gambler only a year ago. Longevity: ★★★★★ – Dig into your past traumas for maximum laughs. Easily among the best OTT dramedy choices. Longevity: ★★★★★ – Not as evergreen as they were a year or two back. A play which became a British show which became an American darling. Longevity: ★★★★★ – Very limited number of episodes and elongated airdates can allow a spec to last a lot longer than usual. Family multicams on an OTT service. Not something you’d think of a decade ago. Longevity: ★★★★★ – One is mired in scandals, the other just got cancelled. But maybe there is hope? Considered by many to be one of the best single cams on the air. Longevity: ★★★★★ – A lower longevity if only for its continuous bubble status and heavy serialization. Longevity: ★★★★★ – Six seasons and counting. Strong pick for a young adult single-cam. Longevity: ★★★★★ – Already renewed for a third season. One of the hottest cable single-cams out there. Longevity: ★★★★★ – And with good reason. Longevity: ★★★★★ – Four years ain’t nothing to sneeze at. Longevity: ★★★★★ – Make sure to watch the third season which is coming out any second. An indie Canadian show that slowly built its fanbase. Longevity: ★★★★★ – But yet another show ending soon. Longevity: ★★★★★ – Three seasons in tow with middling ratings might prove problematic beyond a final renewal. Longevity: ★★★★★ – Many products will be sold as it will soon go into its fifth season. A few years ago, this would have been a stunt spec. Longevity: ★★★★★ – Now, it’s staying on the air. A network single-cam that is shockingly not widely accepted, despite its popularity. Longevity: ★★★★★ – With Big Bang ending, they need to keep the lights on somehow. Longevity: ★★★★★ – …but it barely started its second season with low ratings. Who knows what will happen from there. Proved it could go on to better things despite its C.K. issues. Longevity: ★★★★★ – Three seasons of a lower-key character comedy means you need to dig deep. One is accepted, the other is not. Longevity: ★★★★★ – Hulu means question mark, while Catastrophe is living its last life. Longevity: ★★★★★ – You’ve got time before its third year. Potentially a hard choice to spec narratively, but it’s freely available. Longevity: ★★★★★ – Nobody expected a second season. Longevity: ★★★★★ – See what I did there? A family comedy if anything else. Longevity: ★★★★★ – Strong ratings, but its network means more unpredictability than expected. Longevity: ★★★★★ – …allowing specs to last longer. Longevity: ★★★★★ – A network show with dwindling viewership may mean trouble. Featured on your WonderCon badge. Longevity: ★★★★★ – Pick up one of the comic issues. You’d think a network comedy in its third season would be more read than this. Longevity: ★★★★★ – Never got to reach a higher status as it continues to age. This brings me back to the days of NTSF:SD:SUV::. Longevity: ★★★★★ – Very unique release schedule. Mixed choice since it isn’t a clear-cut pick as a classic comedy. Longevity: ★★★★★ – Changed things around for its second year. Longevity: ★★★★★ – Clowning itself into another season. Longevity: ★★★★★ – Very low ratings could spell trouble. Not a show you’d expect to be as widely read, and yet. Longevity: ★★★★★ – Can you believe it’s already on season four? Longevity: ★★★★★ – You’d think Netflix would guarantee its safety, but with all its weird cancellations, you can never be sure. Sizzling takedowns with a great cast. Longevity: ★★★★★ – Will it surpass the shadows of BoJack and Big Mouth? Hot and new, which means not as widely accepted. Longevity: ★★★★★ – If it fits your voice though, you may be in luck. Longevity: ★★★★★ – Network move, coupled with entering a sixth season. Quirky show with a very unique tone, putting off some reads. Longevity: ★★★★★ – Renewed for a second season and only ten episodes under its belt. Old-school multicams. Very, very old-school. Longevity: ★★★★★ – Still going, it seems. Let me spell it out on your arm. Longevity: ★★★★★ – Who knows with Hulu’s future. Longevity: ★★★★★ – You can’t really grade a longevity of this, but Netflix got the word of mouth. A spin-off that could make its way up. Longevity: ★★★★★ – Barely started. Longevity: ★★★★★ – Another Hulu question mark. “Peak TV” for half-hours may be coming to an end — or at least a holding pattern. This round, we’ve got a whopping 67 different comedies listed and reviewed. It is a lot, but considering that last year we had 63 ranked, this might signify a level of stagnation in the number of half-hours (after huge increases year-over-year in prior lists). When everyone talks about the beginning of the end of Peak TV for comedies, remember you heard it here first. Another interesting tidbit: we’ve got a dead heat in number of shows between traditional networks (22 half-hours), linear cable (21 half-hours), and OTTs (21 half-hours). That’s a lot of offerings and avenues, split fairly evenly. A staggering difference from the past, when networks and traditional cable held a distinct advantage. We’re also seeing the arrival of a bunch of niche networks, like Paramount Network and Pop. Revivals may also be dwindling, with shows like Fuller House and One Day At a Time aging faster than expected (if not outright cancelled). Meanwhile, we have a ton of spin-offs and very unique dramedies (Paradise PD, Shrill, Black Monday). The biggest thing to note however is the “evergreen” status of older cable/OTT comedies, like Master of None, Fleabag, or Search Party. 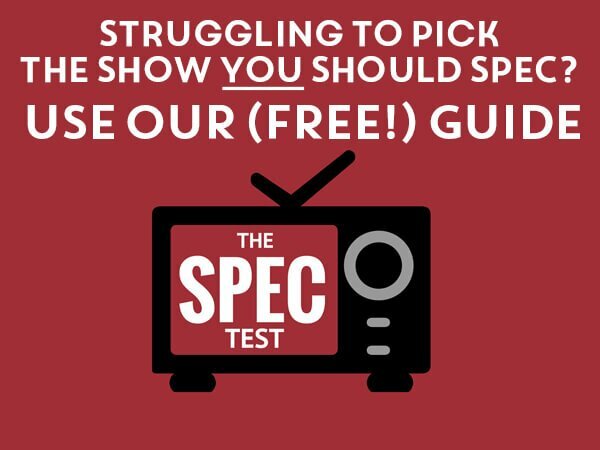 They may not produce new content, but long gaps between their seasons means they offer a staying power as a spec choice that network comedies can’t match. There’s an uncertainty to when shows get cancelled, but when they’re on, they’re staying on. Great news for your next spec.